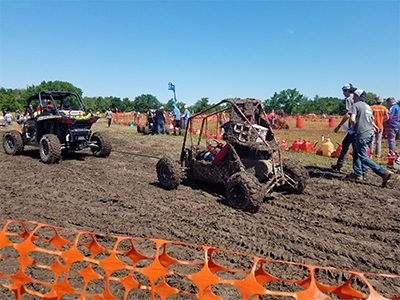 The Southern Illinois University Edwardsville Cougar Baja team showed off its latest off-road vehicle during a Baja SAE (Society of Automotive Engineers) competition held May 25-28 in Pittsburg, Kan. The team, comprising mostly engineering students, designed, funded, built and tested their vehicle in preparation for the collegiate race which includes teams from around the world. Their next competition will be held June 7-10 in Peoria. 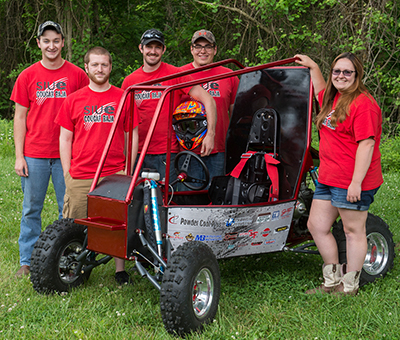 The SIUE Cougar Baja team is a student organization within the School of Engineering. Participating students included Adam Brocksieck, a native of Quincy who earned a bachelor’s in mechanical engineering in spring 2017, as well as mechanical engineering majors Tim Talbert, of Hebron, Tim Koehler, of Mt. Pulaski, Seth Kirchner, of Chillicothe, and accounting major Alexandra Turner. “The Baja SAE events feature four days of competition,” added Brocksieck. “On day one, teams do an engine check and give a sales presentation on the cost of the prototype we have built. On day two, teams go through a technical inspection, give a design presentation to judges from Polaris and perform a brake check. The SIUE Cougar Baja team is in its 11th year and continues to make adjustments and learn from past competitions to come back with a better, lighter, faster and more competitive vehicle. The team eagerly awaits the completion of the School of Engineering’s Student Design Center, which they say will help them excel greatly. Multiple sponsors contribute to the success of the SIUE Cougar Baja team. A complete list is available on the team’s Facebook page. Students pursuing any major or possessing any skill level are encouraged to join the SIUE Cougar Baja team. For more information, email cougarbaja@gmail.com. Photo: SIUE Cougar Baja team members include (L-R) Adam Brocksieck, of Quincy, Tim Talbert, of Hebron, Seth Kirchner, of Chillicothe, Tim Koehler, of Mt. Pulaski, and Alexandra Turner, of Lincoln. 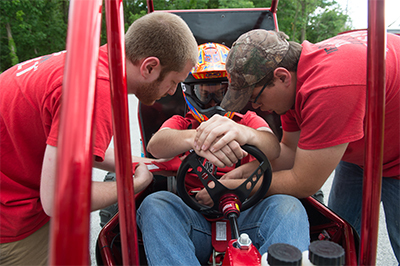 Team members tested their vehicle as they prepared for their competition in Pittsburg, Kan. The Cougar Baja team competed in a Baja SAE competition held in Pittsburg, Kan.